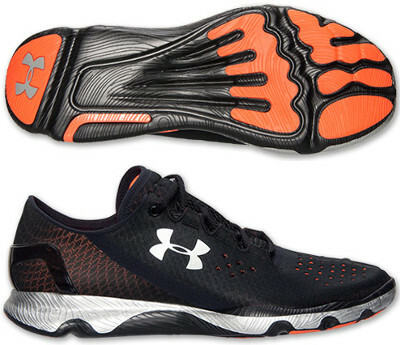 Under Armour Speedform Apollo are neutral performance running shoes. The disruptive Under Armour Speedform Apollo is one of the best news in the market of running shoes in latest times. Brand from Baltimore is well known for high quality products and innovation making this Speedform Apollo one of the favourite running shoe for speed workouts and racing. Upper from Speedform Apollo takes its inspiration from bras seeking great comfort and seamless feel. Although some holes are present in the front side, ventilation is not that great with this tight fitting material. Non-removable 4D-Foam® molded insole prevents slippage and provides extra cushioning. External heel counter combined with TPU curve at midfoot provide extra stability in every ride. Midsole is made from full-length Micro G® foam providing more response after cushioned landings. Cool outsole design in Speedform Apollo inspired by foot bones features extra rubber in more exposed areas but triggers several concerns about flexibility and durability.